Louie, the star of the children’s book series The Little Blue Dog, makes his real life debut as a writer. He shares his experiences, thoughts and tenets about adoption, kindness, rescue, training and many other canine related topics. 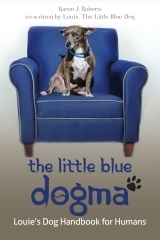 The Little Blue Dogma; Louie’s Dog Handbook for Humans provides one shelter dog’s perspective on humane choices, dog care, and how YOU can become part of the solution to the pet over population problem in the US. Co-written by his human, author Karen J. Roberts lends her support in a thoughtful forward and afterward complimenting Louie’s canine view with her own experiences as an animal advocate, author, pet owner and volunteer in the animal rescue community. The Little Blue Dogma is their first venture into the world of non-fiction. Karen’s focus has been on education, raising awareness and support for animal rescue organizations, and her series of children’s books promoting responsible pet ownership and compassion for animals.